The SCTCCCA said in an email, "On Wednesday of this past week, a runner at one of our member schools and their family lost everything in a house fire. In respect for the family, we will not be releasing the name or school of the individual at this time. The track and cross country community has always been a close knit group, and has always been willing to help each other when in need. The South Carolina Track and Cross Country Coaches Association is asking for teams and/or individuals to consider donating to the family of this runner to help them out during a dark time. To facilitate this, we have asked the meet director's to place a donation spot at the packet pick up area for each qualifying meet- Upper State, Lower State and Mid-State. We will also have a donation location at the State Championship at the packet pick up tent. Please feel free to contact Chris White, president of the SCTCCCA, if you have any questions about the donations. We have set up a Paypal donation site at https://goo.gl/sbz7Rm." 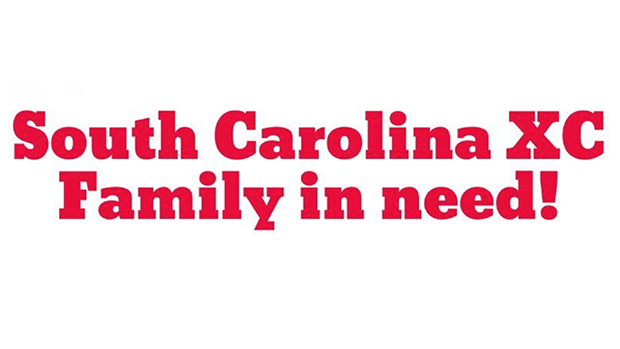 The family is also in need of clothing. The sizes are below. Runner: Small and extra small in shorts, Medium in shirts, 8-9 shoe size.